Heat skillet and add half the dressing. Add the onions and cook 8 minutes or until tender. Add the beans and the water and stir well then cover the pan and cook on medium for 5 minutes. Finally add peppers and recover and cook another 5 minutes. 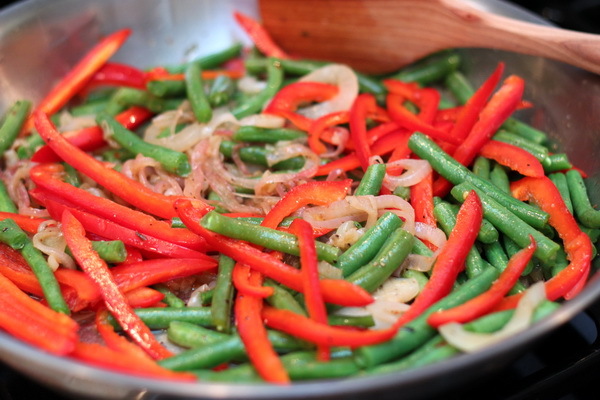 Remove from heat and add in the rest of the dressing, salt and pepper. Cece Beans is just the Italian name for Chick Peas or what the Spanish call Garbanzo Beans – all the same thing 🙂 They are a great source of fiber, healthy and a great addition to many meals. 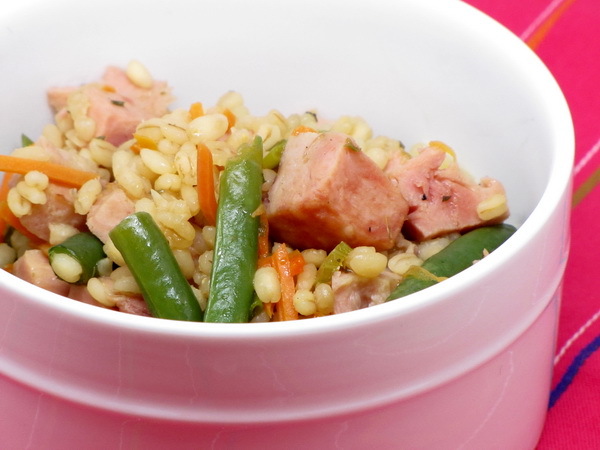 This dish is somewhere between a soup and a pasta tossed with veggies – I guess it is like a gruel, though that has a negative connotation and there is NOTHING negative about this dish. 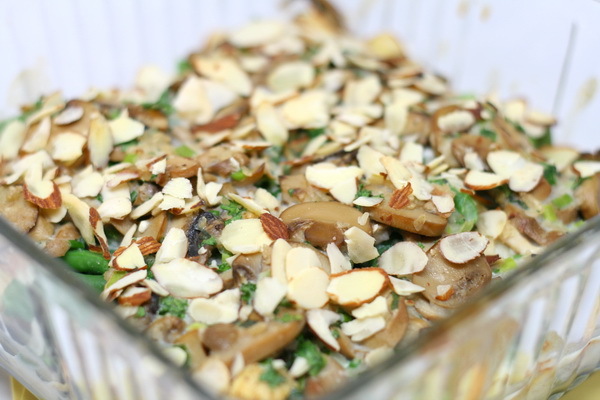 It’s healthy, filling, has super flavor and is one of the best dishes I’ve made in a while ! Heat oil in a Dutch oven and cook onion, leak, rosemary and garlic 10 minutes. Add tomato, water, broth, spices, salt and pepper and ceces and bring to a boil. 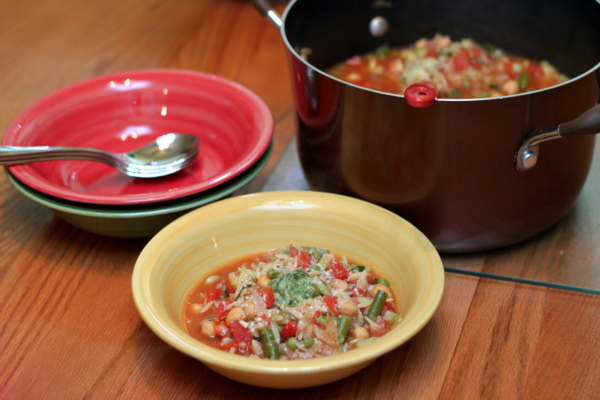 Cover and reduce heat and simmer ½ hour then add zucchini, peas and beans. Bring to a boil then reduce heat and simmer 10 minutes. Bring back to a boil then stir in pasta and parsley and cook 8 minutes at a low boil. Spoon into bowls and top with 1 t pesto and 1 t parmesan. 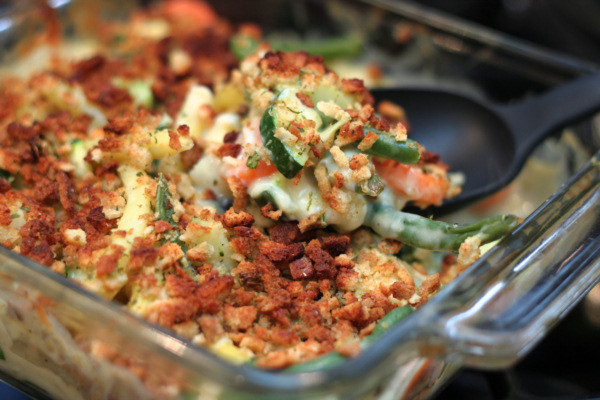 This is just what it’s called…a great company casserole. It is easy to prep, all the prep is done way ahead, and the result is a creamy, tasty vegetable side dish that disappears very quickly ! Preheat oven to 350 degrees. 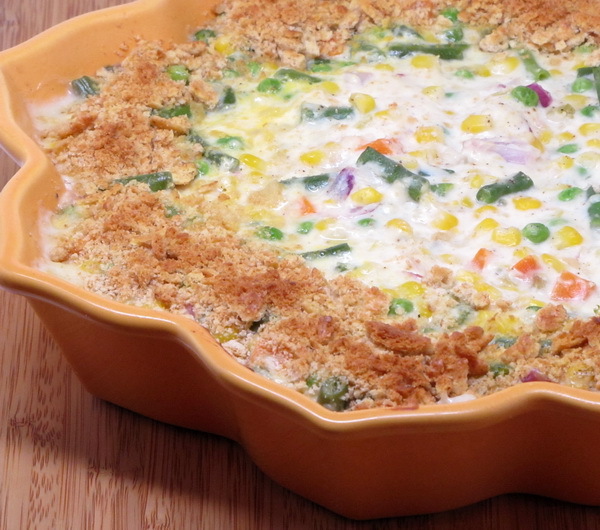 Mix soup, sour cream, cheese, garlic powder, salt, pepper and onion then stir in the veggies and place in a 2 quart baking dish sprayed with Pam. Cover and bake 25 minutes. Then uncover, sprinkle crumbs around edges and spritz the crumbs with the ICBINB spray. Bake another 10 minutes or until the edges are lightly browned. Chorizo is Mexican sausage much like Kielbasa is Polish sausage and Andouille is Cajun sausage. 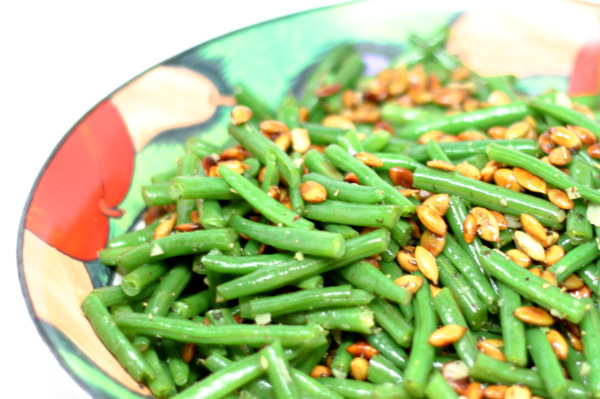 It is delightfully spicy and lends its rich flavor to any dish you add it to including this great side dish made with beans. Heat oil and cook chorizo until crisp, about 3 minutes. Transfer to a plate. Add shallot to pan and cook 2 minutes. Add garlic and cook another 2 minutes. Then add beans and water, reduce heat to medium, cover and simmer 6-8 minutes. Add sausage to pan with vinegar, parsley, salt and pepper. There is something so homey about this dish. 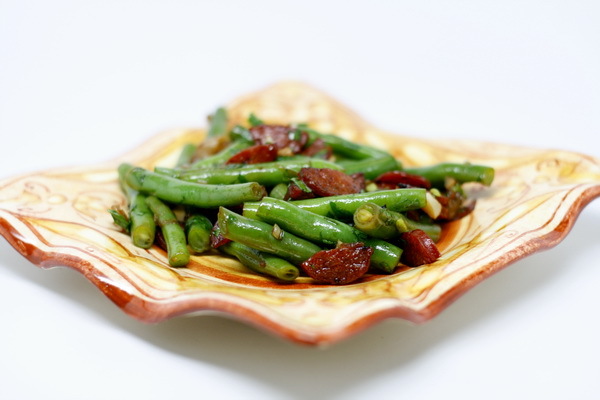 It is savory, filling, and sooooo does not say ‘diet’ – – it makes a fantastic dish to serve guests. Preheat oven to 350 degrees. Spray a 13×9 baking dish with Pam. Melt buttery spread in a skillet on medium high and add barley, carrots, onions, celery and garlic and cook 3 minutes. Remove from heat and stir in ham, basil, oregano and pepper and then pour into the baking dish. Bring broth to a boil in a saucepan and then pour over ham mix. Cover tightly with foil and bake 20 minutes. 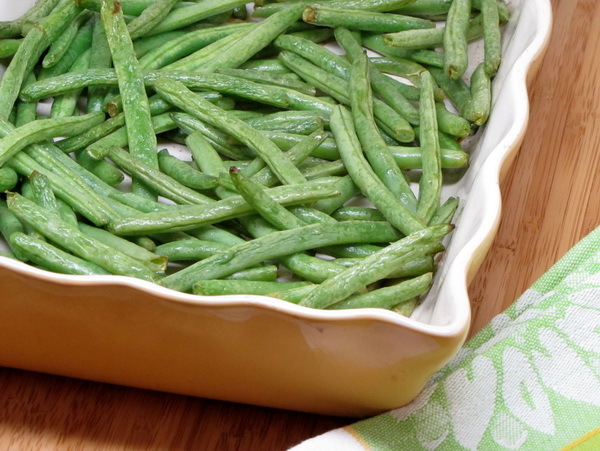 Remove from oven, stir in beans, recover, and bake another 30 minutes or until barley is tender. 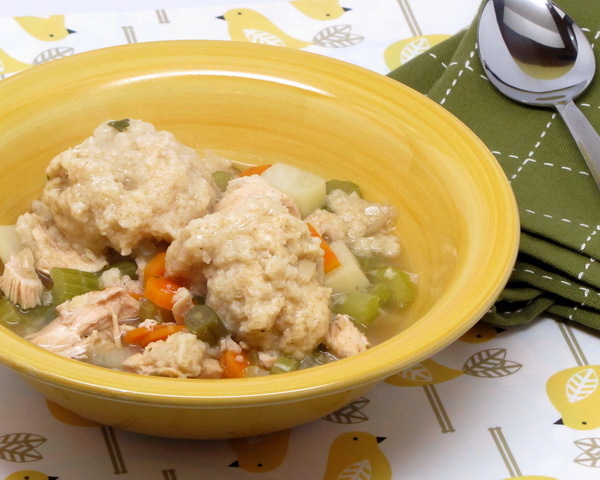 This recipe confirmed all my earlier suspicions – – I REALLY REALLY don’t like dumplings ! heheheh But I know there are lotsa people out there who do and my husband (who is a bona fide dumpling lover) said these were quite tasty ! Combine all soup ingredients in crock. Cover and cook 4-6 hours. Transfer to a large soup pot with a lid and bring to a boil. Then reduce to a simmer. To make the dumplings, mix flour, salt and baking powder in a bowl. In another bowl mix egg, oil and milk and then add to flour mixture. Drop by large tablespoonfuls on top of the simmering broth until the surface is covered. Cover and simmer 18 minutes.